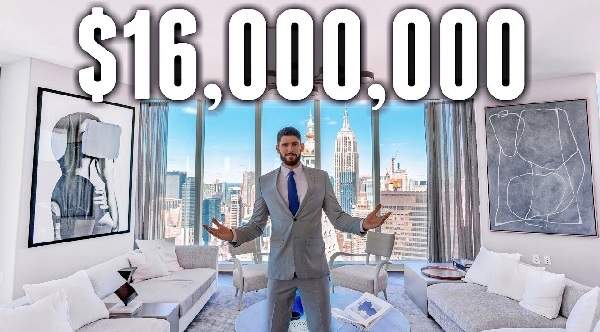 NYC Apartment Tour: $16 MILLION LUXURY APARTMENT! An exclusive luxury apartment tour at one of New York City’s most luxurious million dollar listing penthouse apartments: Madison Square Park Tower! Spanning the entire 57th floor, this 4,655 square foot, four-bedroom, four and one half bath residence unquestionably features the most stunning 360-degree views in Manhattan. Designed for the most discerning buyer who requires perfection: floor-to-ceiling windows with approximate 10-foot loft ceilings and spacious bedrooms each with en-suite bespoke baths. With a boutique collection of only 83 residences, 45 East 22nd will take the crown for the finest views in the Flatiron/Madison Square Park District. Every glittering Manhattan landmark is visible on the 57th floor including the Empire State, Chrysler Building, Clock Tower, Freedom Tower, Brooklyn Bridge, the Flatiron Building, and even the East and Hudson River. Elegantly situated on a quiet historic street, the manor house-inspired granite base fits harmoniously within the tree-lined block. 45 East 22nd is a stones throw away from Madison Square Park and Gramercy Park. Award-winning architectural giant, Kohn Pedersen Fox, responsible for creating masterpieces including the Shanghai World Financial Center, designed an original: Manhattans first cantilevered fluted glass sculpture engineered with chamfered corners to maximize views and create column-free interiors. Renowned interior designer, Martin Brudnizski, known for his brilliance in creating classic spaces by melding history with modernity, takes his cue from the Flatiron Building itself by creating distinctively soft, symmetrical and round interiors. Custom finishes throughout, including cabinetry by Molteni, honed Bleu de Savoie marble countertop and backsplash, White Mountain Danby marble bathroom countertop and flooring, custom Waterworks fixtures and soaking tub. The building features a live-in resident manager, on-site Luxury Attach concierge, and a 24-hour doorman. Amenities include a full-floor fitness center, basketball court, simulator room, playroom, library, billiards, cards room, and terrace with outdoor grill landscaped by Oehme Van Sweden. The Upper Club, FIFTY FOUR, is a one-of-a-kind, spectacular half-floor living room with a beautifully appointed demonstration kitchen for residents use only.